We arrived thinking that the main purpose of visiting Berlin was actually not in the city but south in Zossen, where the Soviets basically evicted all the residents and turned the town into their communications headquarters. The height of Cold War would see "between 30,000 and 70,000 Russian soldiers and their dependents." The underground complex is multi-storied and extensive. It would have made a good trip, for sure, as a complement to the Maginot Line, but Berlin totally sucked us in. We couldn't escape. We were absolutely addicted to the city, which is full of post-military structures and landscapes. We met up with an architect-friend of one of my wife's colleagues, who said to us " I am also interested in the subject of the reuse of former military installations--if you are an architect and live in Berlin, it is an unavoidable theme." He sent us in the direction of Teufelsberg, the tallest hill in Berlin, elevation eighty meters. Teufelsberg means Devil's Mountain. It didn't exist, however, prior to 1945. The Allies built it, shifting about 12 million cubic meters of rubble from an estimated 400,000 ruined buildings. Talk about a Ruin Machine. Beneath the hill lies the half-demolished military-technical college designed by Albert Speer. The walls were so massive that it was becoming cost-prohibitive to destroy it. The Allies were looking for a good place to bury the dead buildings, so add one and one together and you get Devil's Mountain. The ultimate death of a building is not to be reduced to rubble. 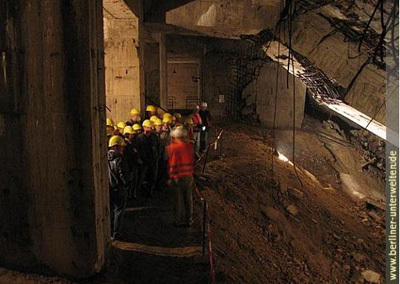 It is to be buried by 12 million cubic meters of a dead city's rubble. Not all of the dead buildings were shoveled to this spot in the west of the city center. The Trümmerfrauen or so-called Rubble Women spent years sorting out the re-useable chunks of buildings, recovering whatever they could. There is no romance to these ruins. These women lived a hard life, having lost their brothers, sons, and fathers in the war. So we can be fascinated by the artificial mountain, but when I saw this brick as I was walking up to the top, I spent a moment thinking about the people who survived the war and lived in its ruin. How funny that a single brick evokes human tragedy to me, where an entire mountain of rubble just sounds fascinating. It was noticed that during certain times the reception of the radio signals was better than during the rest of the year. The 'culprit' was found after a while: it was the Ferris wheel of the annual German-American Festival on the Hüttenweg in Zehlendorf. From then on, the Ferris wheel was left standing for some time after the festival was over. There are more rubble mountains in the city. We got inside of one, the partially destroyed Flak tower in Humboldthain park in Gesundbrunnen. You wouldn't suppose there is a massive concrete ruin beneath this lovely park, the hill rising steeply to the top which affords good views over the surrounding neighborhood. The concrete platform at the top might have been built by a benevolent park association, but no, it was built by Hitler. Constructed in 1942, the anti-aircraft tower is unique to all the sites I've seen this year because it is the first example of a military base or structure where its post-military use was built-in. There are small windows, for example, which serve no military value and in fact, were a weak-point, requiring special steel shutters so that bombs and shrapnel could not sneak inside. Moreover, the monumental, castle-like form of the flak tower was excessive in bulk (the towers were over-budget and fewer were built than was needed). As part of Berlin's air-raid defense, these towers were conceived to work harmoniously within Albert Speer's plans for Germania, the total reconstruction of Berlin. The tower would have been incredibly expensive to remove (this was proved by the Allies in post-war Berlin), and of course Hitler expected to win the war, so why not incorporate them into the future plans for the city? 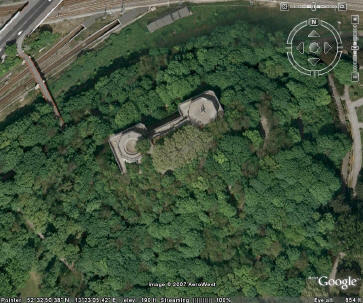 Since the flak tower ate up park land, it is probably most appropriate that it remains a park. I visited the inside of the tower and was required to wear a hard-hat by the tour guides (the Berlin Unterwelten or Underground Society - every city should have one). The inside is a habitat for several species of endangered bats. It is a hollow, artificial mountain in the middle of Berlin, and one of its exposed walls is rated as the toughest rock climb in the city. Is this the future of military space, to erode into "artificial" features in the landscape? Nick, you should check out Noah Beil's rubble-mountain photo project. what is this research leading to? a design proposal? thanks Geoff for the link, those are some eerie, beautiful photos. So you will be producing some speculative design proposals in your thesis, based on this research?